Martha’s Vineyard is one four major breeding grounds for the Striped Bass population including Chesapeake Bay, Hudson River, and the Delaware River. Striped Bass are prized trophy in the world of Sport fishing. A wide array of techniques are employed to catch Stripped Bass such as Trolling and Surf Casting. Striped Bass will also bite fresh bait like, sandworms, clams, mackerel, bloodworms, and herring. The biggest striped bass ever landed was a 78 pound monster, caught off the shores of New Jersey. Recreational limits vary from state to state but regardless of the size the Striped Bass is a thrilling catch and a delicious meal! Capt. Scott McDowell has over thirty five years of experience chasing down Striped Bass on his menemsha charter fishing boat the “Lauren C”. North Shore Charters routinely delivers striped bass in the thirty to forty pound range, thus guaranteeing a more than memorable experience out on the Vineyard Sound. The Striped Bass is a member of Moronidae family. It features a streamlined shape with a silver body scored with long dark stripes stretching from the gills to the tail. Some estimates put the lifespan of the striped-bass at up to 30 years. 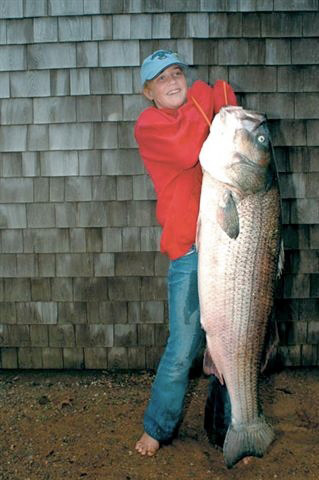 The largest striped bass on record weighs in at 125 pounds with a length of over 6ft. These characteristics are what make the Striped Bass a favorite for Marthas Vineyard Charter Fishing boats. Landing your first striped bass is an unforgettable experience and what better backdrop for such a moment than the pristine Gay Head Cliffs. Book a North Shore Charter and catch your first Striper! If you’re looking to hammer monster striped bass, there is no one better suited to help than Menemsha Charter fisherman, Scott McDowell of North Shore Charters. Relying on thirty five years of fishing experience, North Shore Charters delivers big striped bass as well as many other Vineyard Fish. If your looking to take a striper home with you to savor the memory of a vineyard charter fishing trip, consider a copper striped bass from The Copperworks. The Copperworks online store features hand crafted Copper Sculptures, Bluefish Wall Hangings, and Copper Wall Sconces made by Marthas Vineyard Charter Fishing captain Scott McDowell.